NGS-IQ provides built-in email and FTP, plus the benefits of IBM i security and the ability to query remote data sources. 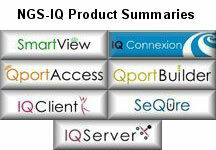 With NGS-IQ you can modernize your reporting without adding another server or database to your network. NGS Software Developer Kit - affordable, one developer license of our query and Web reporting tools bundled with online education and technical support.